Horner syndrome causes problems on one side of your face when the nerves there are damaged. 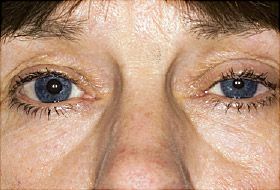 It can have many different symptoms, such as small pupils or droopy eyelids. It's also called Horner-Bernard syndrome or oculosympathetic palsy. You can get Horner syndrome at any age, and both men and women get it. In rare cases -- about 1 in 6,250 births -- a baby can be born with it. You also can have pain or headaches, which happens more often in middle-aged men. Children who get it before age 2 also can have one iris (the colored area around the pupil) that's a lighter color than the other one. Their faces may not flush on one side on hot days or after playing. Horner syndrome can be a sign of a serious health risk such as nerve damage. See your doctor if you notice any of its symptoms. Horner syndrome usually is caused by some kind of damage to a string of nerves that help control your eyes, heart rate, sweat, and blood pressure. Neck or shoulder injuries during delivery can cause Horner syndrome in some babies, but it's very rare. Babies born with damage to their aorta can also have it. And neuroblastoma, a type of cancer, can cause it in some kids. Only 5% of people who have the syndrome are born with it. Sometimes, there's no known reason for it. Your doctor or an eye doctor (ophthalmologist) can do tests to see if you have Horner syndrome. She'll do a physical exam and ask about your medical history to find out if you've had any illness or injury that could have caused nerve damage. Then she'll put drops in your eyes to see how your pupils react. If you have Horner syndrome, one pupil won't widen or shrink as much as it should when the drops go in. Your doctor also may want to test your blood or urine to check for any health problems that could cause nerve damage. There are no treatments specifically for Horner syndrome. The best way to help your symptoms is to treat the health problem that caused them. National Organization for Rare Disorders: "Horner syndrome." Genetics Home Reference: "Horner syndrome." American Academy of Ophthalmology: "Horner syndrome."